There are so many things in LA that adults and older kids can enjoy, but it's a little more challenging to find activities to keep the pre-K set entertained. The Bob Baker Marionette Theater is just the thing to entrance the little ones who haven't yet figured out that cartoons and other animated characters are not real. Adults and older kids who appreciate the art of puppetry and the simplicity of this retro form of entertainment will also be charmed. A Los Angeles Historic-Cultural Landmark located in Silver Lake, near Downtown LA, the Bob Baker Marionette Theater is one of the oldest children's theaters in the country, operating continuously since 1963. Puppet master Bob Baker has been crafting his signature marionettes since the 1930s, not only for this venue, but also for over 100 movie and TV productions. He and his team have also been handcrafting puppets for Disney since the 1970s and continue to create these and other collectibles in their on-site workshop. They do various shows during the year and every other year they alternate between a marionette version of The Nutcracker and the Bob Baker Holiday Spectacular at Christmas time. Many Angelenos who visited the Bob Baker Marionette Theater as children are now bringing their children and grandchildren. The shows are also popular with pre-school and school groups, (so be sure to make a reservation, as shows do sell out). Visitors have the option of sitting on folding chairs around the room or on the carpeted floor. The floor provides the opportunity to see and interact with the marionettes at eye level and more easily tune out the puppeteers controlling them, who are in full view. While children and parents are instructed not to touch the marionettes, the puppets have no such restrictions and are free to tap you on the shoulder or come sit in your lap if you're conveniently located at the edge of the performance space. The productions are a sort of variety show that does not usually have a story line. Each show uses between 100 and 125 of the over 3000 puppets in the collection. Characters dance to show tunes, children's songs and classic kitschy pop numbers, depending on the theme. I attended one of the hour-long holiday performances with my sister Carol, her 4-year-old son Declan and my friend Lisa. We sat on the floor at the edge of the carpet with a day care group ranging in age from about 6 months to 8 years old. Declan and the other pre-schoolers present were completely entranced by the frolicking characters, and even most of the older kids were able to suspend their disbelief and appreciate the magic of the dancing stars, ice-skating carolers and a flying Rudolph the Red-Nosed Reindeer. Lisa appreciated the artistry of the marionettes while retaining a long-held discomfort with them left over from too many psycho horror movie puppets. After the show, guests are treated to old-fashioned cups of ice cream with a wooden spoon in a reception room, with coffee also available for adults. Hand-crafted marionettes and hand puppets are available for purchase. Cake can be arranged for birthday parties at the Theater. Bob Baker's touring marionette shows also put in appearances at fairs and festivals around Southern California and elsewhere. Check their website for specific driving directions. Although the address is 1st Street, the location is under the Beverly Blvd/1st Street Bridge. The parking entrance is off Glendale Boulevard. 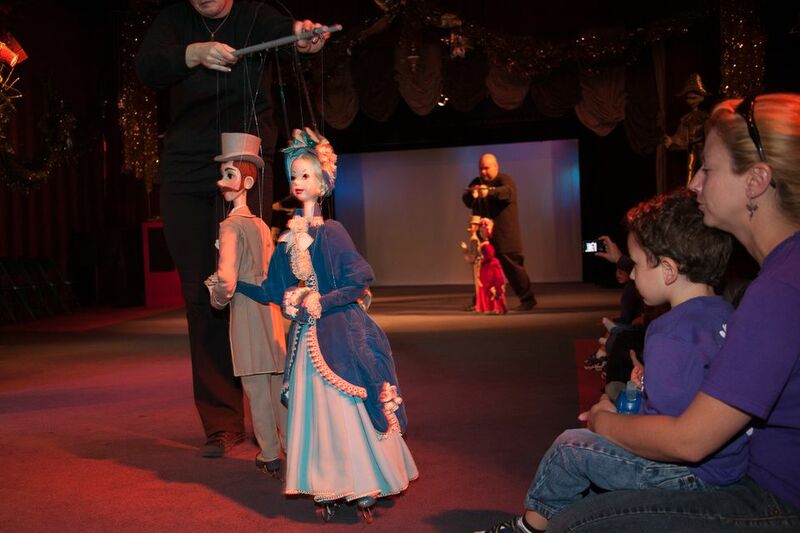 Like many arts organizations, the Bob Baker Marionette Theater struggles to stay open, so if you can pay full price for tickets, they would certainly appreciate it if you support them by doing so. However, if you're strapped for cash too, you can check Goldstar.com to see if discounted tickets are available.